The tenor sweet potato has a mellow, soothing sound. After briefly experimenting with ceramic ocarinas, I finally returned to wood. And Charlie Hind's are the best out there. I love my tenor sweet potato. It is easy to play and I have to admit it sounds better than clay. Plus, it won't shatter if you drop it. I'm sold on Hind ocarinas. I'm selling my clay ones. Thanks, Charlie. I'll definitely order from you again. I have finally looked upon and even held the ocarina. It&apos;s as much of a work of art as it is an instrument. The case is gorgeous and the ocarina is beyond words. It sounds every bit as beautiful as it looks. Thank you so much for the wonderful instrument and case. dreamful sound and how easy and soft it is to play, I love it, love it, love it. And I meant to say thank you! Just got back from the post office. This thing is beautiful. So beautiful, in fact, I almost don&apos;t want to play it... almost. It sounds great, plays easily, and looks fantastic. Thank you Charlie Hind, for making such amazing instruments. I can honestly say I&apos;ve acquired a new treasure today. I received my tenor ocarina a couple months ago, and I have cherished it ever since. The instrument is beautifully crafted. I will on occasion take the ocarina out of it&apos;s case only to admire its beauty. The notes sound clearly, and in a dream-like quality that I adore. I have also played my ocarina for the enjoyment of close family. On multiple occasions I have found a soothing of my soul when I began to play a tune. A zen state of mind will overtake me and I soar, if only for the moment in time my soul sings. In short, I have never found greater pleasure in a musical endeavor than I have playing my Tenor Ocarina. 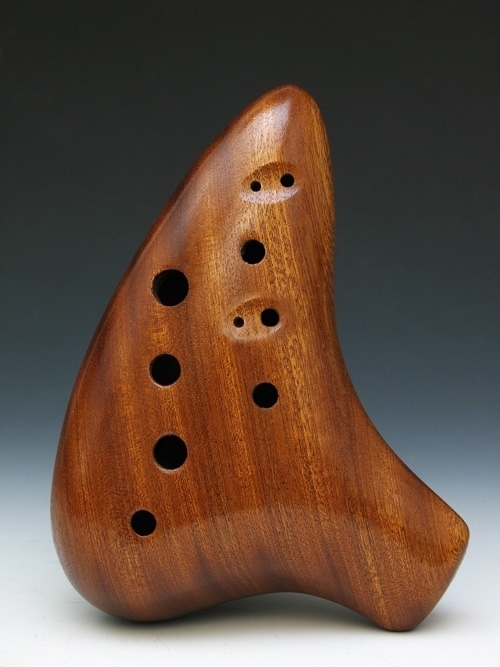 This ocarina is awesome! I don&apos;t have one, but my friend just received his recently and it is absolutely beautiful. It has the most beautiful tone I have ever heard on an ocarina.